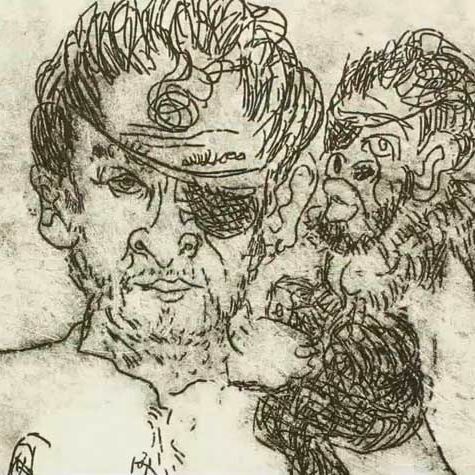 Still from Sam Messer’s animation of Denis Johnson’s “Denis the Pirate”. Courtesy of the artist. Denis Johnson’s great-great-great-great grandfather was a pirate. This bit of family lore weighed on the author’s mind as he and his old friend, the artist Sam Messer, traveled to the Grenadines in the late 1990s. They were attending the artist residency Moonhole in the company of Kiki Smith, Sally Mann, and Rachel Whiteread, as well as Messer’s 6-year-old daughter, Josephine. Johnson, who had published the short-story collection Jesus’ Son a few years earlier, sometimes entertained Josephine, his goddaughter, with a tale he wrote called “Denis the Pirate.” It was the story of a fearsome pirate who sailed the seas with a one-eyed, one-armed, one-legged monkey who smoked mushrooms and spoke 27 languages, including Elephant and Iguana. The story had been sitting in a drawer for 15 years, but Messer, now associate dean of Yale’s art school, says, “I’ve always known I wanted to do something with it.” Now he has begun producing hundreds of etchings for his first animation, “Denis the Pirate,” narrated by Liev Schreiber. Arcade Fire violinist Sarah Neufeld and saxophonist Colin Stetson composed the score. The video, excerpted here, will be on view at Fredericks & Freiser Gallery alongside a series of collaborative collages and drawings that Messer made with the novelist Jonathan Safran Foer, beginning June 18. Messer will also show his paintings of Paul Auster’s typewriters at Garth Greenan Gallery beginning the same day.